New Columbia Distillers in Washington D.C. burst onto the scene in 2012— and in addition to their rather excellent Green Hat Gin, they’ve released a few seasonal selections along the way. The list includes their winter variation Ginavit and their warm weather variant— Green Hat Summer Gin. As Green Hat Summer Gin is a seasonal gin for spring and summer, I’m heavily assuming this is a gin built for the official drink of summer: the Gin and Tonic. If you’re putting out a seasonal gin for summer, you’ve got to be able to handle lazy days in the yard -being combined all willy-nilly with lemonade, tonic, or whatever else might be sitting in the cooler. Green Hat Gin was bright, floral, and contemporary styled. Naturally, you might be expecting that here as well. The nose of Green Hat Summer Gin immediately calls to mind a fresh field of flowers and cool homemade strawberry jam. It still has that citrusy, slight hint of spice nose that their main gin has as well. But overwhelmingly floral, but very nice. The taste starts out with a tinge of spice, leading with bright citrus. Lime and orange, but not entirely distinct. A bit of heat rises and that’s when the floral notes start to hit you, rose and lavender, and unusually sweet. There’s some juniper in the close, along with a peppery earthiness. Nice balance and a lot of distinct unique flavors. Green Hat’s seasonal gin features a botanical which is rare outside of spring seasonal gins: Fresh Cherry Blossoms. Other’s like Lockhouse Distillery from Buffalo also have a “cherry blossom” seasonal variant. Cherry blossom has also appeared in Japanese gins such as Roku as a signature regional botanical. For those of you are who really into the idea that a gin’s unique botanicals should contribute a sense of place, there is a connection between Cherry Blossoms and Washington D.C.
Every spring Washington D.C. plays hosts to the National Cherry Blossom Festival. The trees were a gift from the mayor of Tokyo in 1912, and the festival is a huge annual event attracting over 700,000+ people to Washington every year, with articles in all the major papers of when the Cherry Blossoms are in peak bloom. 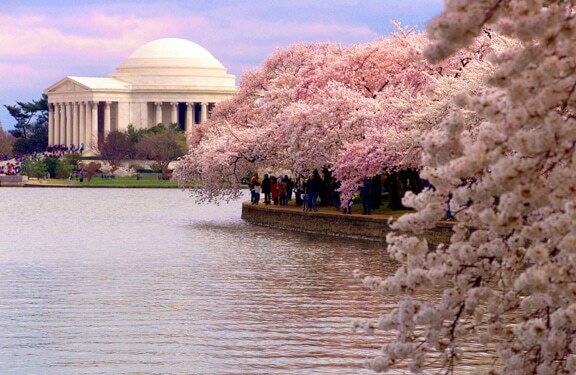 In a way, the Cherry Blossoms are special to Washington, but also a note which pays homage to Japan. It’s an annual reminder that spring is official upon us. First, in a gin and tonic. The floral notes up front are kind of hidden and it puts a bit of emphasis on the tail notes of juniper and warm spice. Good, still somewhat floral, but perhaps not as overwhelmingly so as you might have expected. That touch of bitterness competes with the florals just a touch. To really highlight this drink, I think that it was best in the Gin Rickey, with an honorable mention to the South Side. I’d also suggest a Gin and Bitter Lemon— the cherry is a perfect complement to bright lemon and bitter tonic notes. I’d further recommend a Finnish Long Drink. This is just a great pairing with citrus. I found that it actually made a rather good Negroni, the floral coming through nicely, but a mellow, almost cinnamon like sweetness on the close. Bright, floral and a great spring/summer gin to make those spring/summer cocktails. Love the increase in proof over the main Green Hat Gin, but its a tall order to compete as a spring/summer gin when the main offering already is a quintessential summer gin. For the season, I don’t think you can go wrong with either Green Hat regular or Green Hat Summer Gin in your cooler. That is if you’re the kind of guy or gal that packs a bottle of gin in your cooler. I used the spring/summer gin to make cherry juleps for the Kentucky Derby, they were really good. The maraschino liqueur really brings out the floral flavors in the gin. By the way, at my liquor store in DC it was $65 a bottle! I really like the Green Hat seasonal in a classic martini. I mix it 3-1 with Dolin dry vermouth and a couple of dashes of orange bitters. Garnish with orange or lemon peel. VERY good for the summer.